“The Racal RA3712 is a relatively hard to come by professional receiver. It was widely used by the Royal Navy, but certainly found several further areas of use. Unfortunately there is little specific documentation available describing the RA3712 fields of application. The RA3712 is a dual HF receiver. This means that two independent receiver modules are mounted in the chassis. Switching between the receivers is done via keypad command. Variable > 1Hz > depending on the turning rate of the tuning knob with flywheel effect. AGC: slow, medium, fast & manual. Additionally, the gain control auto / manual can be combined. 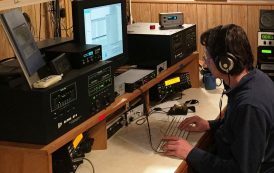 A special AGC setting is reserved for the “Link11” military radio link. Like many professional RX, the RA3712 were custom fitted. This means the receiver will only in very few cases be equipped with appropriate filter bandwidths for SWL use. The AM filter of this specific unit is 12 kHz wide. Much too wide for reasonable AM reception. This leaves only the 2.7khz and the 1.8khz filters. So AM stations can only be heard reasonably by switching to SSB mode. I’ve been comparing the RA3712 with the legendary AEG/Telefunken E1800/3. The RA3712 has installed more suitable SSB filters for our needs compared to the E1800/3. But this has to do only with the width of the filters, not their selectivity. The E1800/3 uses mechanical filters that are incredibly sharp! The RA3712 uses quartz filters of comparable selectivity. Both receivers perform almost on the same level. The RA3712 audio is quite similar with a treble-dominated tendency. A clear benefit of the RA3712 is its pass band tuning! Signals can be “edited” for better intelligibility which is not possible with the E1800/3. Unfortunately, the pass band tuning is a bit complicated to use. First select PBT in the menu, then select the filter, and only then you can use PBT. Although the RA3712 has a flexible AGC, it can best be used in manual gain control. So noise can be handled elegantly. In terms of reception the RA3712 plays in the top league. In a low noise RF environment, the RA3712 is a wonderful shortwave receiver. Like the E1800/3, the Racal RA3712 is a top receiver.